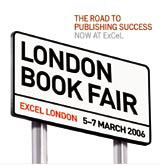 Loewy Group is creating the marketing communications for the London Book Fair 2006. Loewy will produce all marketing materials, including exhibitor packs, brochures, tickets and posters. The Fair runs from 5 to 7 March at Excel in London.